Too often in business we tend to revere success and demonize failure. We build up firms as ‘Titans of Industry’ while the ‘formerly successful’ are relegated to the provenance of jokes, and examples of what-not-to-do. Yet we neglect to mention that once upon a time, these Titans of today were nothing but upstarts in the realm of prior Titans. In Trustco, we study failures as well as successes, and with good reason. It is not comfortable to study failure – indeed, common sense suggests that you should rather study what drives success, if you wish to replicate it. But the dark spectre no one wants to acknowledge, is that all failing businesses, just like many others, are presumably staffed with clever, capable people – they were, after all, the incumbents new competitors measured themselves against. In 1997, Clayton M Christenson published his book The Innovator’s Dilemma. The Economist called it one of the six most important books about business ever written. It examines how the good and proper management that leads companies to success, are paradoxically also why they lose their positions of leadership. 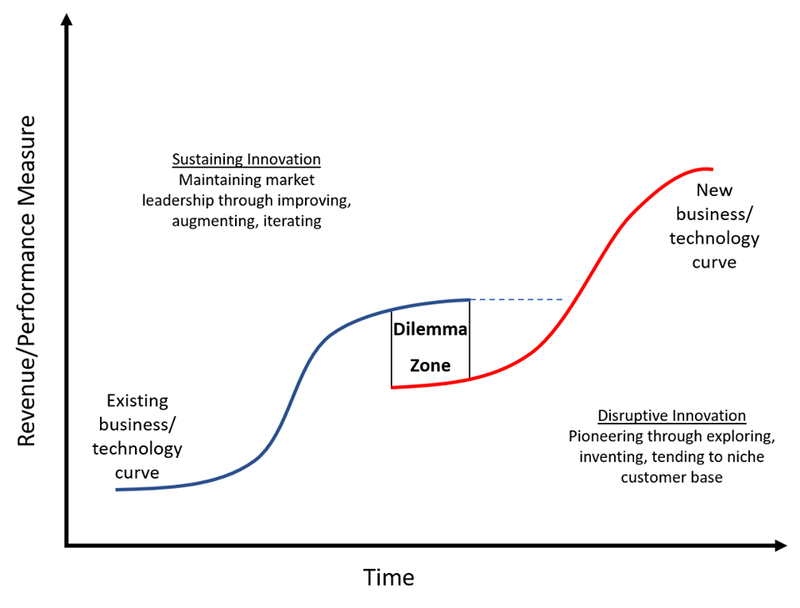 The quintessential innovator’s dilemma. 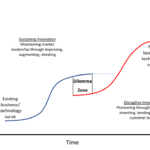 Disruptive innovations often unseat successful, and well-managed companies even when they have a great customer focus, and invest heavily in research and development. Smaller, underserved markets are quite often neglected by these firms, due to small margins and an inability to provide adequate growth to a large firm. Hence, listening to your ‘high-end, high-margin’ customer, can be strategically counterproductive. This also overlaps with the incumbent misidentifying its market, focusing on the product it provides, and not the customer need it serves. Thus, when a disruptive innovator serves the low end of the market, to a customer who was previously not served, and who is willing to pay for a ‘good-enough’ product, but not a premium for enhancements, they are dismissed quite easily. But in the smaller emerging market, the cost of failure is not as high as for the incumbent. With iteration on product improvements, improvements to the disruptor’s product are faster and more often, and soon the disruptor will have moved to a higher, more profitable segment. Since this segment is not as profitable for the incumbent, not much effort will be invested in maintaining market share, and it will move up-market. Thus an incumbent is pushed upwards and upwards, serving smaller and smaller markets, until the disruptive product meets the needs of the incumbents’ most profitable market segment, and drives them out. Witness the decline of film cameras as digital cameras went from ‘not very good, but cheap’ to ‘good enough for casual use, but keep film for quality’ to the situation today, where a film camera is a novelty. Africa, as a whole, has been quite underserved by traditional ‘First-world’ type companies. Namibia, with its smaller market but quite developed economy and abundance of underserved clients, seems like fertile ground for a disruptive innovator. For incumbents, it would be wise to remember that it is better to make yourself obsolete, before someone else does. This is why Trustco takes all the necessary steps to stay ahead of the curve. We’d rather out-innovate ourselves, before letting someone else do so.